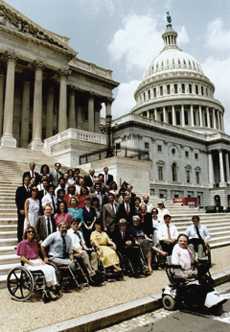 Throughout his career, Senator Dole advocated for the disabled, having been injured himself during World War II. Among his most notable accomplishments were the creation of the Dole Foundation in 1989, an organization that helps disabled people find employment, and the Americans with Disabilities Act of 1990, which he later described as one of his proudest achievements. If you would like to use these items, just let us know in advance so we can have it ready for you when you arrive! Please feel free to contact us at doleinstitute@ku.edu if you have any questions or concerns.